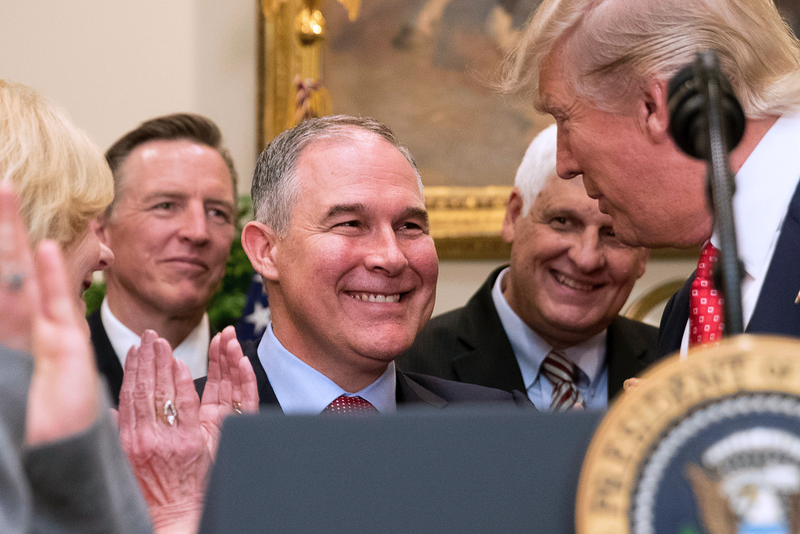 Environmental Protection Agency head Scott Pruitt, who wants to ensure the US doesn’t invest a single dollar in protecting humanity from climate change, nonetheless wants to use the agency’s limited funds to protect himself from other humans. Last month, President Trump released a draft federal spending budget requesting $2.3 billion in cuts to the EPA. Under Trump’s budget, climate change research would be obliterated, funding for the clean up of hazardous sites would be slashed by 45 percent, environmental justice programs would be phased out, and a projected 3,200 jobs would be eliminated. But as the New York Times reports, there is one EPA activity that could see an uptick in funding: personal protection for its fearless leader. One enforcement activity that could be set for an increase: security for Scott Pruitt, the new E.P.A. administrator. The agency has asked for 10 additional full-time staff members for a round-the-clock security detail — a first for an E.P.A. chief, who usually has only door-to-door protection — and more than doubling the agency’s infrastructure and operations staff. According to E.E. News, former EPA head Gina McCarthy’s security detail normally consisted of six to eight personnel who assisted only during international travel and public appearances. But as Myron Ebell, who headed Trump’s transition team for the EPA, explained to E.E. News, Pruitt sees the extra protection as necessary not just because of protestors, but of his own staffers. “I think it’s prudent given the continuing activities by the left to foment hatred, and the reported hostility within the agency from some unprofessional activists,” Ebell told the site. Scientists with the EPA have written a series of open letters protesting Pruitt’s confirmation, but to suggest that EPA staffers are a violent threat is a grave accusation, and one that reveals an intense climate of mistrust within the agency. When cuts do finally come down later this spring after a a thorough congressional review, we can expect that climate to worsen, though hopefully not to the point of all-out mutiny.